This week is the 45th anniversary of the adoption of the Clean Water Act. This post takes a quick look at where we were, where we’ve been, where we are, and where we’re going on clean water policy. Congress enacted the law in response to rampant contamination of waterways and brought about important improvements across the nation. By the 1960s, pollution brought numerous water bodies to the brink of death. 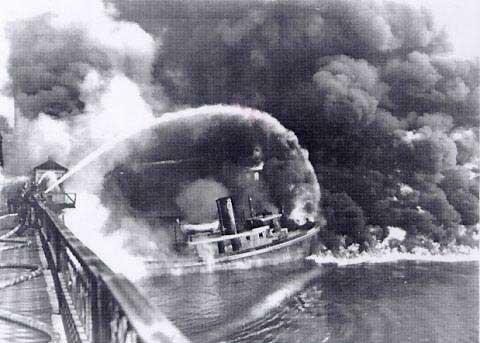 The Cuyahoga River, running through Cleveland, Ohio into Lake Erie, became so polluted with industrial waste in the 1950s and 1960s that it famously caught fire on more than one occasion. Lake Erie itself received so much municipal waste and agricultural runoff that it was projected to become biologically dead. Unchecked water pollution in inland waterways accounted for record fish kills; for example, some 26 million fish died because of the contamination of Lake Thonotosassa, Florida. Industry discharged mercury into the Detroit River at a rate of between 10 and 20 pounds per day, causing in-stream water to exceed the Public Health Service limit for mercury six times over. Waterways in many cities across the country served as nothing more than sewage receptacles for industrial and municipal waste. The rate of wetlands loss from the 1950s to the 1970s was approximately 450,000 acres per year. To read more, please visit National Resources Defense Council's website.